There are moments you experience as a sports fan that you’re not sure will be equaled for future fans. Most of these happen on the field, court, pitch, etc.. and some don’t. Today saw one of those moments — with six new inductees into Baseball’s Hall of Fame. New inductees are ushered in each year, but this year was something special. The six newcomers, three players and three coaches, represent one of the most talented classes ever to come in together. But what makes it special is the class of the six. For me, these were the names that made me a fan. These were the names of my childhood. The cards I traded. The all-star games I watched. Not just these three, of course, but the others — the all-stars that these three played along with — have become tainted since that time. Steroids, of course, are the scar on the face of late-20th century baseball. These are its pure souls gone to baseball heaven. There aren’t many of these kinds. The players who dominated, ostensibly, on pure skill while their peers used performance enhancers. 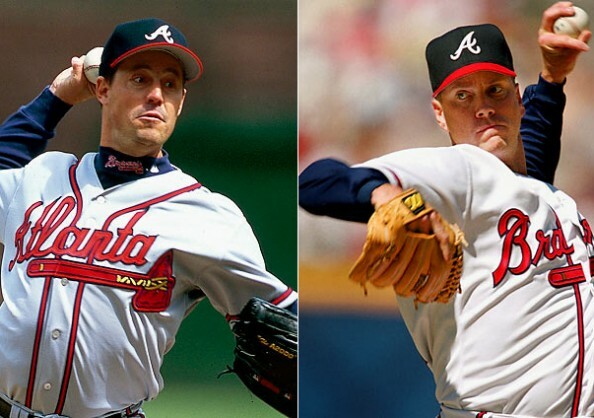 It brings a smile to my face remembering Greg Maddux and Tom Glavine mowing down the juiced up hitters of those days (even when it was Sosa, my team’s ‘stud’). They did it with skill. Never overpowering. Never elevating tempers. Skill, precision, talent. Their manager knew precisely how to use that skill, too, and for that reason Bobby Cox was inducted today with them. And then there was the Big Hurt. A slugger in an era of mega-sluggers. Without steroids, Thomas may have been the premier power hitter of the 90s. He was still up there. He still put up HOF numbers. He was an MVP. He should have had several. His name doesn’t deserve to be outshadowed by Bonds, McGuire and Sosa. He was of their ilk, just not of their morality. It’s simple: sports isn’t a stage that requires class acts. It doesn’t have to be. We like our athletes for what they do on the field. We forgive, all too easily (cough Ray Rice cough cough cough) when they act immaturely and should poison our perceptions. This group didn’t put us in that doubtful position. Look no further than Joe Torre’s remarks today. If this doesn’t sum up a great man’s life in baseball, I don’t know what would. You can sense his deep and emanating respect for the game — and his gratitude for the success he was allowed in it. Cheers to this class of men. Thanks for the memories, gentlemen.